There’s a secret to this soup being so smooth and velvety. Two thirds of the beans are pureed with the soup, which adds that creamy mouth feel. Then we add the reserved whole beans to the pot for extra texture. 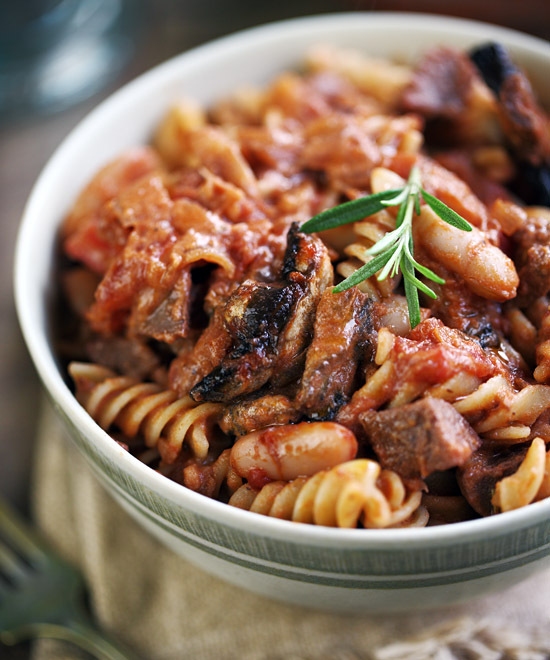 It’s such a warming and comforting taste of the Mediterranean! This soup is also proof that you don’t have to have much in the way of ingredients to make a hearty and flavorful meal. It contains little more than canned tomatoes, canned cannellini beans, onion, garlic, olive oil, stock and a some simple seasonings — and it can be whipped up in under half an hour. We usually make a double batch and freeze it in serving size portions — it gives us a sense of contentment to know we can have a tasty and nutritious lunch or dinner on the table within minutes. 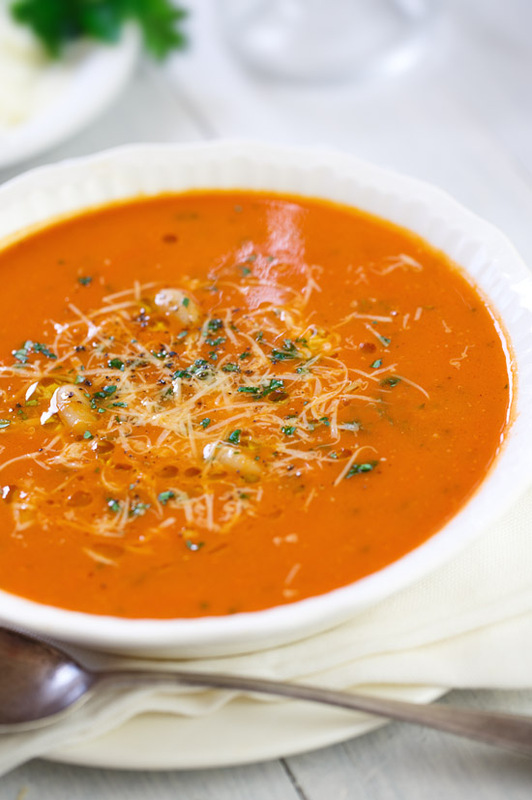 I could say that Parmesan cheese is optional, only because the soup is so tasty by itself, but we love the way it goes a little stringy as it melts into the hot soup, adding its own cheesy creaminess. 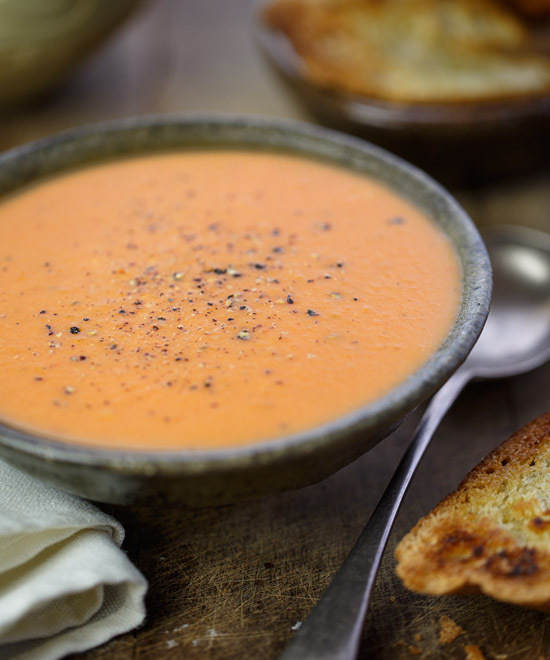 An ideal accompaniment for this soup is some crusty Italian bread like ciabatta, or rustic whole wheat bread. A smooth and velvety Tuscan-inspired tomato soup with a combination of pureed and whole cannellini beans, and topped with Parmesan cheese. HEAT 2 tablespoons of olive oil in a large saucepan. COOK the onion for 5 minutes, stirring occasionally. ADD the garlic and anchovies and cook for 2 minutes. ADD the stock, canned tomatoes, tomato paste, salt, pepper and rosemary. RESERVE one-third of the cannellini beans, then add the remainder to the soup. STIR to combine and bring to the boil. COVER with a lid, reduce the heat to medium, and simmer for 10 minutes. REMOVE from the heat and puree the soup in a blender or with an immersion (stick) blender. RETURN the soup to the saucepan, and stir through the reserved cannellini beans to heat through. REMOVE from the heat and stir in the fresh parsley and remaining tablespoon of olive oil. SERVE sprinkled with Parmesan cheese. 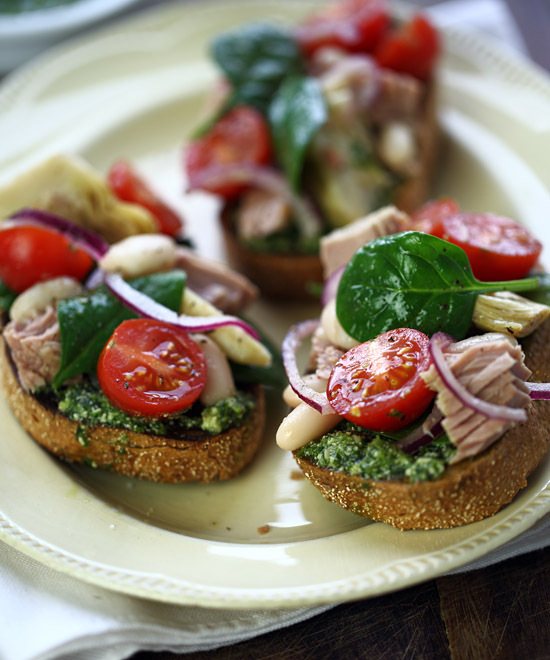 Variation: For a vegetarian version, remove the anchovies and replace with half a teaspoon of salt.